The route runs in the southeast edge of Snežnik plateau, its start and finish on Črne njive above the town of Ilirska Bistrica. The racetrack in the first part is set up on solid macadam trails among high pines and blooming karstic grassland. 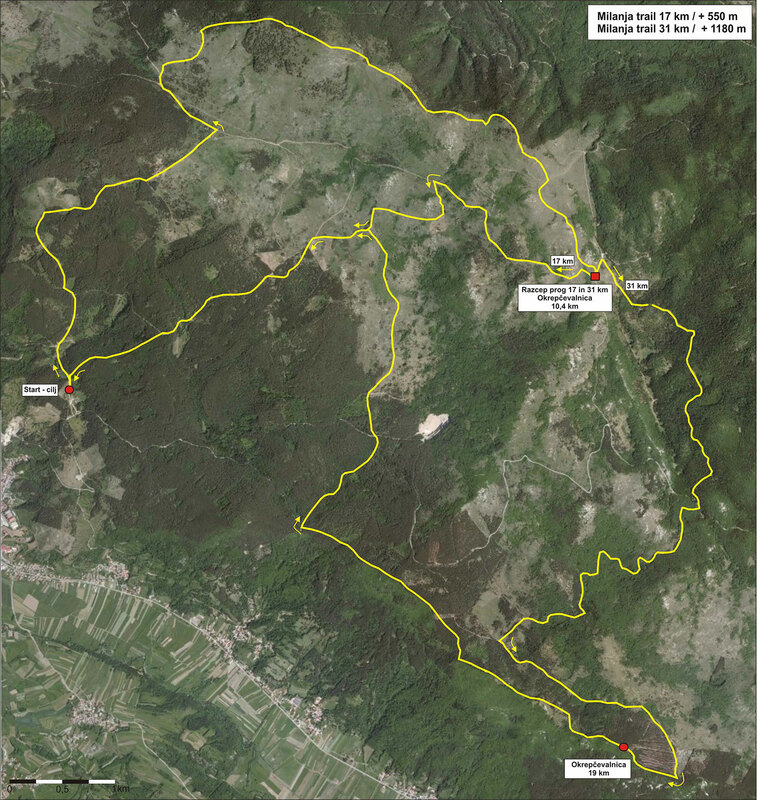 Then the runners will cross a picturesque Milanje ridge (known also as Volovja reber) with its highest peak Velika Milanja (1099 m), a home of beasts and raptors (mountain eagle, griffon volture). A view stretches from this point to Brkini, Čičarija with its peaks Učka and Slavnik, Vremščica, Nanos, the Kvarner Gulf with the island Cres and Pivka valley. Nice weather conditions offer a view to the Julian Alps and even Italian Dolomites. Runners will pass military bunkers (caverns), the so called Alpine wall where the first refreshment point will be set at the division of 17 and 31 km racetracks. The trail will continue on macadam routes and accompanied by smells of colourful flowers you will descend towards the finish line. Run in step with unspoilt nature. The route runs in the southeast edge of Snežnik plateau, its start and finish on Črne njive above the town of Ilirska Bistrica. The racetrack in the first part is set up on solid macadam trails among high pines and blooming karstic grassland. Then the runners will cross a picturesque Milanje ridge (known also as Volovja reber) with its highest peak Velika Milanja (1099 m), a home of beasts and raptors (mountain eagle, griffon volture). A view stretches from this point to Brkini, Čičarija with its peaks Učka and Slavnik, Vremščica, Nanos, the Kvarner Gulf with the island Cres and Pivka valley. Nice weather conditions offer a view to the Julian Alps and even Italian Dolomites. Runners will pass military bunkers (caverns), the so called Alpine wall where the first refreshment point will be set at the division of 18 and 31 km racetracks. The trail will continue on macadam routes through a mighty beech-fir forest of Snežnik plateau. A descent will take place on the open landscape up to the foot of the hill Kozlek. After leaving behind the lookout edge of Snežnik plateau which stands out steeply above the River Reka valley you will climb the peak Kozlek where the second refreshment point will be located. Running will continue on the mentioned edge in descent through the forest of black pine and over dry karstic meadows until the finish line. The three highest ranked competitors in each category receive medals, first three female and male members in absolute achievement receive a trophy and a memorial gift. Event organiser holds the right to changes.